Is there a balance when it comes to technology and quilting? Can you have too much technology in the quilt making process? What a juicy topic! My absolute first thought when I saw this question is that my online blogging community MUST love technology in the quilt making process – we blog about our quilts and use technology to share them, right? But that thought and assumption and confidence quickly went away. Just focusing on thinking about quilting and blogging, there is a balance for each of us, and I know that for me the balance of blogging, posting on Instagram, Facebook, etc. etc. etc., seems to shift and change almost daily. Can there be too much technology? Yes – so much that I don’t have time for quilting! I see us all making these choices (and more) at each step of the quilt making process. For me, each decision is unique for a quilt. Sometimes I follow a pattern, sometimes I make my own. Whether I choose to use a computer or not to make a pattern depends on whether or not I anticipate making the pattern to sell. I do not tend to hand sew or hand quilt, but I do love to finish my binding by hand. I will machine bind on occasion for time or cost reasons. I choose how to machine quilt based on a quilt’s size and the quilting pattern desired. Perhaps a better way to phrase the question is: Are you influenced in how you view a quilt based on how much technology was used in the quilt making process? To me, a quilt is a quilt is a quilt. If it has a top, a back, batting (or perhaps not? ), some king of binding, and a method to hold it all together, it is a quilt. I am especially fond of quilts that get to be used and snuggled, but I can also appreciate wall hangings, art, and other special quilts that hold meaning. Does this question resonate differently with you? 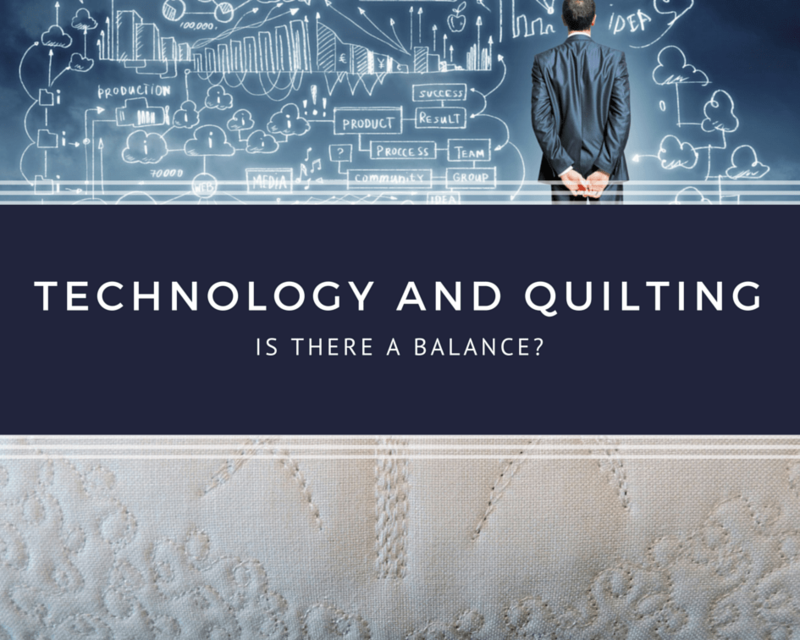 Where do you fall on the technology balance in your own quilt making? What an interesting topic! I think personal preference plays a large part. I don’t like hand work, sadly I lack the creativity to design other the odd adjustment but am in awe of people who can! My machine doesn’t have the capacity to have a stitch regulator and unless I evict a child don’t have room for a long arm! Where technology plays a huge part for me is just this wonderful world of the online quilting community. The inspiration, the access to tutorials, advice etc etc etc. that is what determines what I quilt. I see a design, technique, fabric I mull it around and then set to. As a consequence I wonder whether quilters today dabble more in different design/technique terms than in the past. I’m a new quilter so can’t look back but it would be interesting to ask more experienced quilters whether they have found the proliferation of technology has changed what they do or not. I love to look at quilts that are very detailed works of art, but for me, I want my quits to be used by my friends and family! I’m thinking it is too early to answer such a thought provoking question! There are a couple things I do because I love to do it, such as hand sewing bindings on. Technology won’t change that for me. I get a million ideas via technology and use them to some extent in quilts. A variation, a block, a color. I would say that the majority of my quilts are originals. I play with EQ7 technology to make blocks or play wiith layouts. So, technology is an influence!! I love quilts to be used too…regardless if they are artsy or not. I hope this makes sense…more coffee please! Thanks for the post and question Yvonne!! It does make sense, Jayne! I agree that hand sewing bindings is just something that I love to do, too. It makes me feel connected to my paternal grandmother who introduced me to quilting. I’m a bit of a technophobe! Yes I blog, and follow blogs, and I like Pinterest, but that’s about my limit. I do generally prefer the immediacy of machine sewing (on a nice, simple machine! ), but I like to have some hand sewing around too. Generally, I’m a pencil and paper kind of person! I’m a technology girl all the way. I hate to hand sew anything, and if I could afford a computer for my long arm, I would do that as well. But that is me, I love that we are each free to choose the path that we want to follow. I don’t judge quilts by the amount of technology that went into the process. I will say if it is hand quilted I admire that gumption to do that, but I don’t value a machine quilted quilt less. Even thought I blog and use EQ7 to design, other than that I’m pretty technology-challenged, and I’m not on Facebook, Instagram, etc. I think there’s plenty of room for technology in quilting, up to a point. Just my opinion, but I have seen award winning show quilts that I thought were too technology-based: Digitized embroidery & computer-driven quilting used exclusively, nothing else throughout the quilts. To me, that takes a lot of the “I made this” out of play, when the maker can walk away and let the computer-driven machine do the work. I prefer more of a mix of done-by-hand and technology-aided. That said, our quilting community is all-encompassing and accepting of so many different quilting styles, so I think there’s room for various degrees of technology use among us. I think that digitized embroidery has not spoken to me; but I know it is perfect for some people. On the quilt show side of things, I definitely try to put myself into the “it is a win just to submit a quilt for juried consideration” frame of mind. Not that it 100% helps, but everyone has such different tastes and styles – and I honestly appreciate that! I do agree that at large the quilting community is so accepting of so many different styles, and I like that a lot. I think one of the sneakiest ways that technology creeps into my quilting is how it keeps me from getting down to the actual nitty gritty of sewing. I tend to spend a lot more of my precious studio time on the computer than in front of the machine. And the social media side of tech is a tricky, tricky beast to manage. I keep feeling more and more pressure to adopt new platforms (Instagram for one) so I don’t miss out on anything. I use Pinterest to hoarde my inspiration and FB to communicate with my qulity peeps… and that doesn’t even touch on blogging and reading other blogs. Sometimes I wonder if I’d be better of disconnecting from all of it and just sewing. Never mind the trends, never mind the celebrity quilters…. just sewing. I wonder if there is a product/process balance that parallels the more/less technology balance. Technology turns out projects faster; less technology allows for more enjoying of process. Maybe. On another note, in the “olden” days when machine quilting was almost verboten–around the 70s–I remember a quilt historian mentioning that our forebears used the machine to quilt as soon as it was invented. Maybe for more utilitarian pieces, but nonetheless used. Maybe so long as technology serves us instead of determines where we proceed? I think that your thought that technology should serve us instead of lead us is great and worth more thought for me. It is interesting how some technology is so readily accepted and adopted (the sewing machine) but others, while adopted by some, are not considered “show worthy”. I think that as long as I enjoy making a quilt it is splitting hairs. I have the very basic version of EQ, but have only used it twice since it is so limiting. So mostly my technology use is for blogging, social sites, find inspiration and learning new technique (this was the first thing I did since I’m 90% internet taught). Everything else is scribbles on papers that blow around when the fan is on, ha. I have EQ5 and abandoned using it a while ago. I learned Inkscape and have been having fun using it as a tool – I have also been enjoying Canva for images lately, too. I do love pencil on paper – I always have some when we travel as that is when I seem to find a lot of inspiration, anyway. Total techie when it comes to design. Graph paper for me is the stuff I wrote my school Physics experiments on – I love designing on the computer and flit from Visio, Touchdraw, EQ7 and a quick sketch in my notebook all the time. I do agree with Jenn though on the social media side – It takes a lot of time to keep in touch with people and not feel isolated when making at home. Takes much of my time during the week to just keep up with blogs let alone IG and FB hardly ever gets a chance. Weekends I try and unplug and just sew, clean the house and catch up with friends and family. Setting aside the weekends for your sewing time is a really great idea; and one that I have definitely been considering (no tech Sundays, or some such). What interesting comparisons. For me, the technology depends on the project. I have done everything you listed, but probably use technology the least in designs. I am mostly a pencil and paper gal. There is something so satisfying about being able to sketch on paper – and I still really prefer that for when I am travelling, especially! I kept saving this post in my queue for the right moment when to fully take time to digest the whole technology and quilting question. For me technology is a tool to make things easier, all the technological advances in sewing machines do make quilting easier. I agree a quilt is a quilt and if it’s used and love it serves it’s purpose. Finding the balance between social media (technology) and quilting is a harder balance, as I want to be apart of the online community and share with other quilters what I am working on, but at the same time I want to have time to enjoy sewing. You do such a great job reading so many blogs and leaving such wonderful comments, I find myself envious of all you can accomplish! So seeing this post actually makes me grateful of all the advances in sewing, without them I wouldn’t be able to accomplish so much! I do think that the advances in sewing are mostly things I am super grateful for, too.